My favorite treats this time of year are goodies filled with warm aromatic spices and nuts. 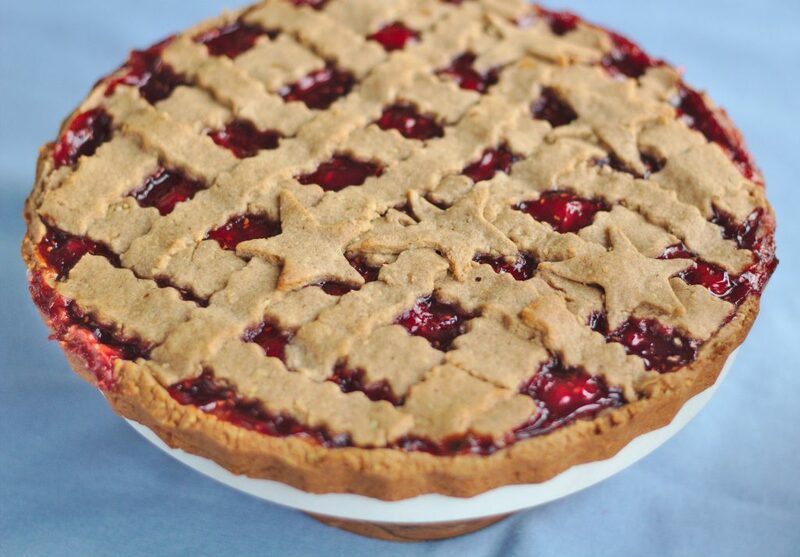 And this Linzer torte is loaded with both. 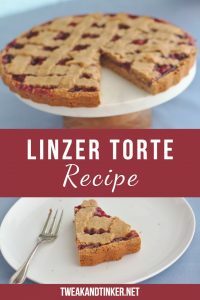 Linzer torte is named after the Austrian city Linz where it was created way back in the 17th century. It’s one of the oldest recorded tort recipes in history. The basic dough made of flour, sugar, butter and egg is enriched with nuts, cinnamon, lemon zest and clove to give the treat it’s distinct warm taste. 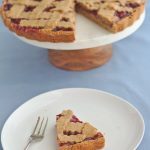 Before baking, the tart is filled with raspberry or currant jam and topped off with strips of dough arranged in a criss-cross pattern. Sometimes an egg wash is used, and sometimes there’s a dusting of powdered sugar or slithered almonds on top. It’s sooo good. The rich flavorful dough absorbs some of the juicy tartness of the jam making for a perfect combination. It is moist but not soggy, and the crust has a nice nutty crunchiness to it. Can you tell how much I love it? 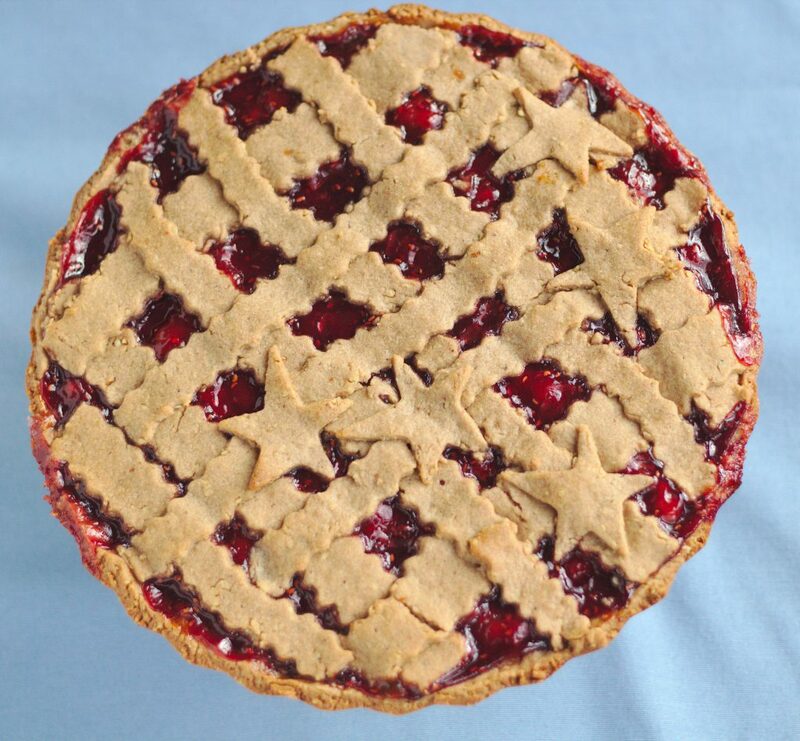 Growing up in Germany Linzer torte was a staple in every bakery and supermarket around Christmas time. Making it really transports me back to the motherland which is nice especially around the holidays. I use a food processor to make parts of the dough. This allows me to use the butter when it’s cold straight out of the fridge AND I don’t have to put the dough back into the fridge before it’s workable. Amazing, right? If you don’t have a food processor, simply cream soft butter and sugar together, then add the egg and lemon zest. In a separate bowl mix together your dry ingredients and slowly add them to your wet ingredients. 2. In a food processor put flour, cocoa, cinnamon, baking powder, clove and salt. 4. Add butter and pulse until you see small crumbs. 6. In a separate small bowl whisk together egg and lemon zest. 7. Add sugar, ground nuts and egg to the flour mixture. 8. Work dough first with a spoon, when dough starts to come together use your hands to knead dough until it forms a cohesive mass and holds it's shape. 9. Set 1/3 of the dough aside and place the remaining dough in a non-stick 10 Inch (26 cm) pie pan with removable bottom. 10. Press the dough evenly into the pan with your hands until bottom and sides (1 1/4 inch) are covered. 11. Bake shell for 15 minutes. 13. Remove shell from oven and let cool slightly. 14. Reduce oven heat to 350 degrees. 15. Sprinkle the surface of the shell with breadcrumbs until evenly covered. 16. In a small bowl give jam a quick stir until soft. 17. Spread jam evenly on top of the breadcrumbs. 18. Take remaining dough out off the freezer and cut into 1 Inch wide strips. Using a knife transfer them onto the torte. Place the longer pieces in the middle and the shorter more towards the sides. Arrange them in a criss-cross pattern. Don't worry if a "strip" breaks or isn't the exact right length. You can always "glue" them back together or use left over dough to fill in gaps. In the oven the dough will melt together. 19. Bake for 40 - 45 minutes. 20. Sprinkle with powdered sugar after cooling. 21. 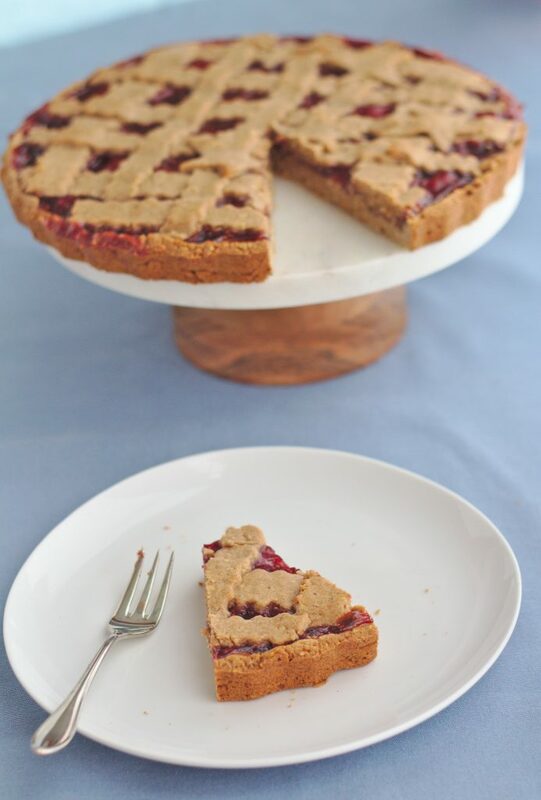 Linzer Torte stays fresh for 1 - 2 weeks when kept airtight in the fridge. It also freezes well.